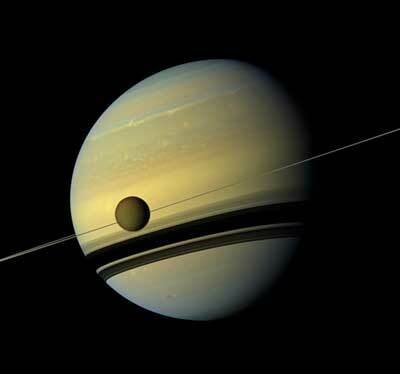 (Nanowerk News) NASA scientists have definitively detected the chemical acrylonitrile in the atmosphere of Saturn's moon Titan, a place that has long intrigued scientists investigating the chemical precursors of life. Now, NASA researchers have identified the chemical fingerprint of acrylonitrile in Titan data collected by the Atacama Large Millimeter/submillimeter Array (ALMA) in Chile. The team found large quantities of the chemical on Titan, most likely in the stratosphere -- the hazy part of the atmosphere that gives this moon its brownish-orange color. "We found convincing evidence that acrylonitrile is present in Titan's atmosphere, and we think a significant supply of this raw material reaches the surface," said Maureen Palmer, a researcher with the Goddard Center for Astrobiology at NASA's Goddard Space Flight Center in Greenbelt, Maryland, and lead author of a paper in Science Advances.